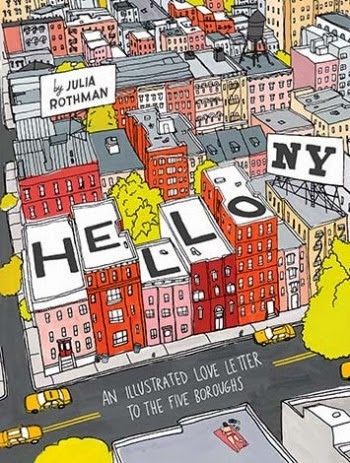 Monday night I popped on over to DUMBO to attend the book launch party for illustrators Julia Rothman and Wendy MacNaughton's books Hello NY: An Illustrated Love Letter to the Five Boroughs and Meanwhile in San Francisco: The City in its Own Words, respectively. The two sat down for a Q&A session with Brain Pickings' Maria Popova about the process of creating illustrated books of their hometowns, where the trend of hand-illustrations is heading, the "godmother" of long-form narrative + illustrated storytelling Maira Kalman, and how they each took similar projects in two different directions. While MacNaughton let the characters she met tell the story of life in San Francisco in their own words, Rothman, being the native New Yorker that she is, completely injected herself into her book and showed us the city through her eyes. 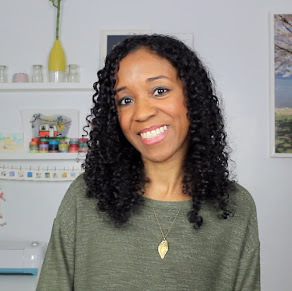 From the small island off the Bronx in which she grew up, to her odd finds paired with more popular attractions to pieces of her family history, and tidbits about NYC life that'll make out-of-towners go "Whaaa?" and natives go "Yup!" Rothman tried to give everyone a little something to chew on. "Well that's nice to remove yourself," Rothman laughed after MacNaughton explained why she wanted the people she met to create the book in their own words rather than hers. "I put myself as the main character. I was born on City Island in the Bronx, a small island that nobody had ever heard of and I really wanted everybody to know about it. So I wrote a book about where I was from and what I liked about my city and everything else about it. I put some voices in there, but it's mostly all me...and my family, the people I've met, and my landlord. I don't know, maybe New Yorkers are self-obsessed and San Francisco people are really nice." 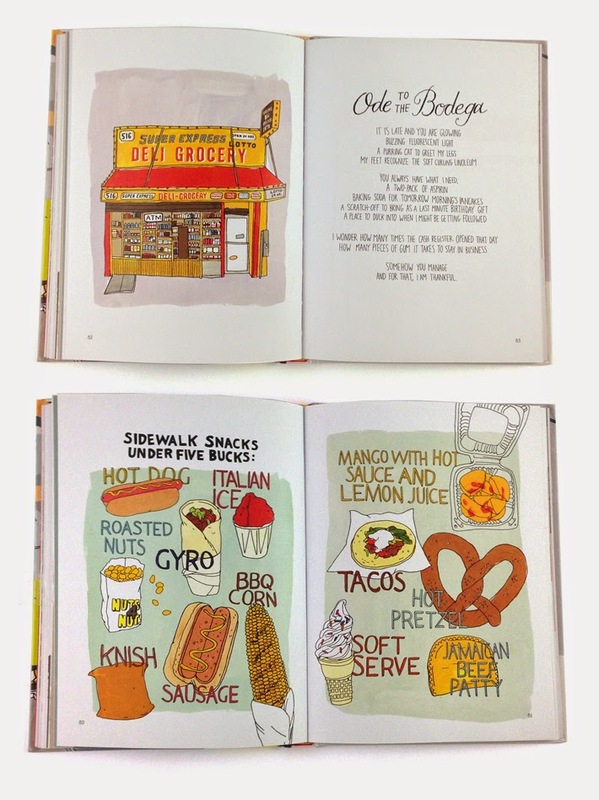 As the daughter of a bodega owner, I was especially delighted to see her write an ode to the bodega. "I wrote something about bodegas that was like bodegas are really great and you can get anything you want and then I was like this is really boring and crappy. And it was kind of a last-minute thing that I sent to [editor] Bridget [Watson Payne]. It was just random, it wasn't really that thought-out. If I write a paragraph about how good bodegas are, it wasn't that interesting. I didn't feel like it was getting across the feeling and if I could write the light and the tiles on the floor then it would get across the feeling more than just bodegas are great," Rothman said before Popova added why it's such an appropriate piece for a book about New York City. "It's actually such a beautiful poem that's really a metaphor for the city because the last line is how many pieces of chewing gum does it take stay alive, stay in business and that's kind of how the city is. How many little daily moments and little people does it take..." she said. "How do these places stay in business?!" Rothman interjected. "There's so many people going in and out, every dollar...When I was in San Fracisco, there's no bodegas, in other cities there's no bodegas and you're like where do you buy your food?" As for how she chose what to include out of love for her city versus an obligation to include more popular sites, Rothman said she tried to put in a little of both to please New Yorkers and visitors alike. "There was always a balance like if I put the Statue of Liberty in is that cliché? But then maybe I can put in Minerva, the statue in Greenwood Cemetery and balance it. There was always something that was very New York and then well, if I'm putting this very New York thing in, what's a more obscure thing I can put in that will help make it not so obvious," Rothman said. "It was always who's the audience? New Yorkers or everyone? So if it's both you have to put in some stuff for New Yorkers and you put in some stuff for the rest of the world. 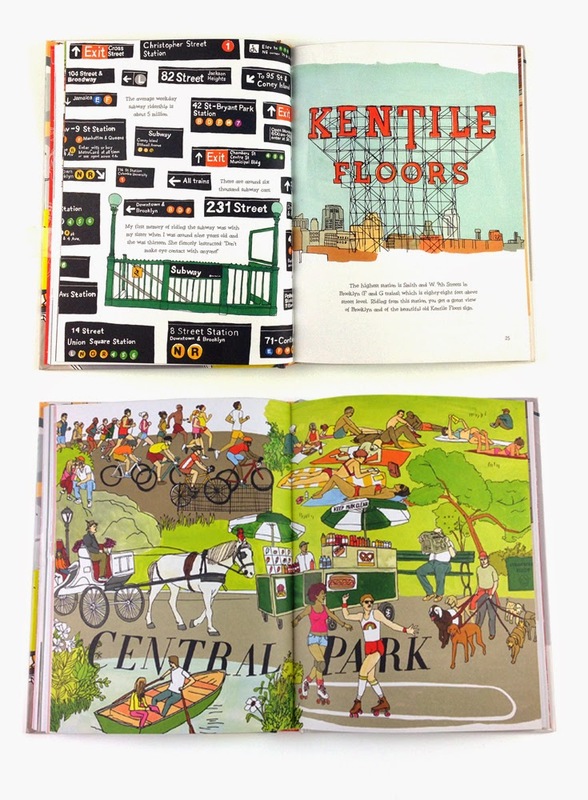 You have to put in Grand Central, but you can also put in the Troll Museum." What I liked about the book, which I pretty much blazed through in a couple of hours, is seeing my hometown through somebody else's eyes. The other day I was strolling through Union Square Park after having lunch with A. and said, "We live here...and everyone else thinks it's awesome." Do I think it's awesome? Most of the time, yes, but other times I'm just tired of the same sights, sounds, and pace of New York City. I want to live somewhere else and even if I end up returning years later, I want to have experienced life elsewhere. Until that happens, I'll continue to enjoy hearing about NYC through someone else's lens. It's probably why I love talking to those who visit for the first time ("Yes, please remind me why my hometown is incredible...") and I'm mildly obsessed with Humans of New York. A curiosity for other people's stories and the lives that I brush up against every day are what keep me intrigued about this place. As Popova said at the book launch party Monday night, "I think the beauty of both books is actually the deeper messages. They both answer the question 'What is it like to live like this other person that's sort of so close to me in the city, but is not me?' And what it's like to understand what that life is like." This is so neat, Dorkys! It´s funny because living in NYC is like a dream come true for many people and you realizing "we live here... and many think it´s awesome" is that typical feeling of someone who is that involved, I guess. I´m friends with people all over the world and Europe seems to be that fairy tale to them and they flip when I tell them about something from my city. That always keeps me grounded kind of, seeing my life through their eyes and realizing "ah yes, of course, I live here and it´s amazing".